*If roasting your own chicken, remove from fridge and pat dry. Roast at 425°F to golden and the internal temperature reaches 165°F on a thermometer. Let cool then separate chicken from skin and bones and pull into bite-sized pieces. For the sauce, heat a skillet over medium to medium-high heat with olive oil, 1 turn of pan. Melt in butter, add celery, carrot, onion, garlic and cook to soften. Season vegetables with salt and pepper, and add hot sauce, sugar, Worcestershire, beer and tomato sauce and stir to combine. Add chicken meat and let simmer a few minutes for flavors to combine and to thicken. To assemble, on the roll bottoms place some pickles, cabbage, some sloppy Buffalo chicken, blue cheese crumbles and set bun tops in place. 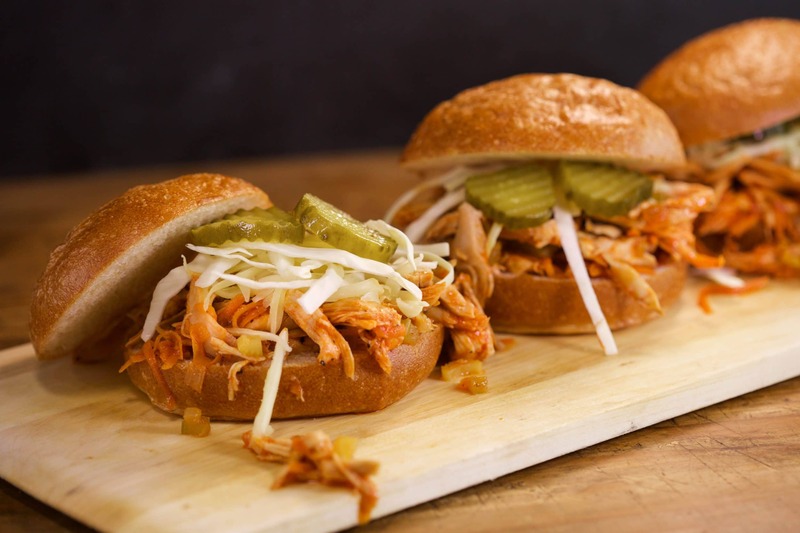 Keep chicken warm in a slow cooker with toppings and buns alongside. In Recipes-list.com we have selected the most viewed recipes from category - uncategorized . Enjoy the best recipes specially selected for you! Sloppy Buffalo Chicken Joes is the right choice that will satisfy all your claims.